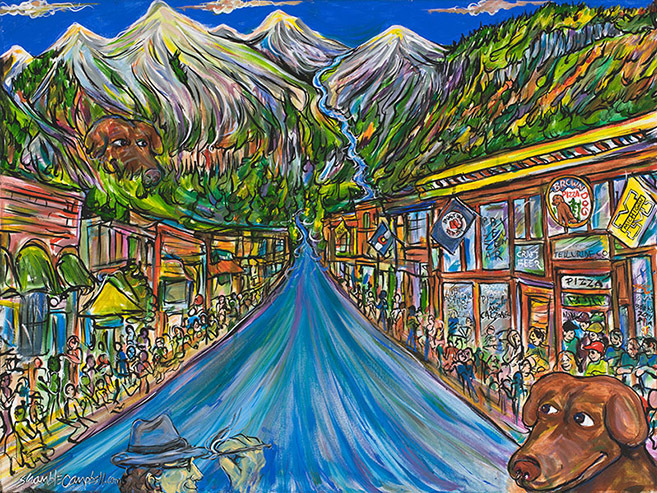 On September 14, 2014 Brown Dog Pizza commissioned local Denver artist and our great friend, Keith “Scramble” Campbell to paint a street scene of Brown Dog Pizza. 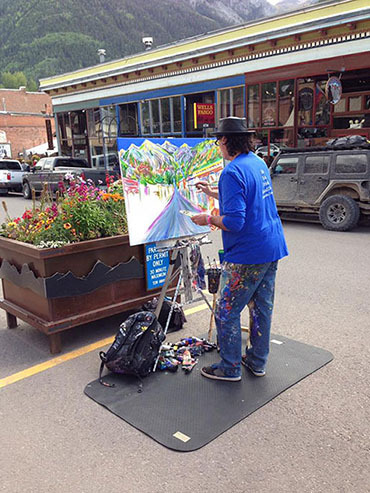 The painting was created during the Blues and Brews Festival. Scramble included in the painting several of the founders/owners of Brown Dog Pizza (Jeff Smokevitch and Dan Lynch) favorites. Their chocolate Labrador retrievers – Phlounder (upper left, in the clouds) and Boone (lower right corner). Boston Red Sox and University of Michigan flags are flying on Main Street. How is Scramble’s Brown Dog Street Scene artwork reproduced? You can now order the print one of two ways. The first way is a “Rolled Canvas”. The Rolled Canvas is a Giclée canvas print, like the Stretched Canvas, but the canvas is rolled and placed into a tube for a less expensive shipping option. This means that you will be responsible for having the print mounted or stretched on a frame once you receive it. This option is better if you plan to have the print framed and want to save money on shipping. The other way to order a print is a “Stretched Canvas”. This method is commonly called a “Gallery Wrap”. A Gallery Wrap involves stretching Giclée canvas prints so the canvas print wraps around the sides of a wooden frame, called stretcher bars. The gallery wrap is then secured to the back of the stretcher bars in the traditional manner using staples. This method of stretching and preparing a canvas print does not require an expensive decorative frame and comes ready to hang. The art on canvas print is sprayed with a UV protective coating and then hand stretched. Each finished piece is carefully inspected before it is available delivery. Since this option is more bulky, the piece will be delivered in a box or crate and will cost more to ship. This option is for those that don’t desire framing and want to hang the print right out of the box. 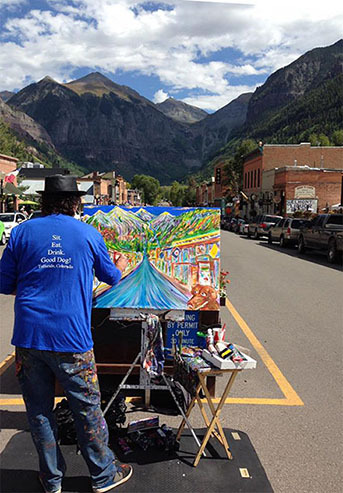 Colorado based artist Keith ‘Scramble’ Campbell is nationally recognized for his paintings ‘live and in concert’ because he actually attends concerts where he completes paintings during the course of a single performance. Campbell endeavors to capture- through light, color, texture, composition and vigorous brushwork- the inherent feeling of the music and actions of the performers. For two decades, Campbell’s ‘performance paintings’ have been inspired in places like the intimate setting of a dark nightclub to the collective consciousness of a large concert or festival. The subject matters of Campbell’s paintings include the musically elite as well as up and coming new talent. Including artists such as: BB King, Fats Domino, Willie Nelson, Widespread Panic, and String Cheese Incident. 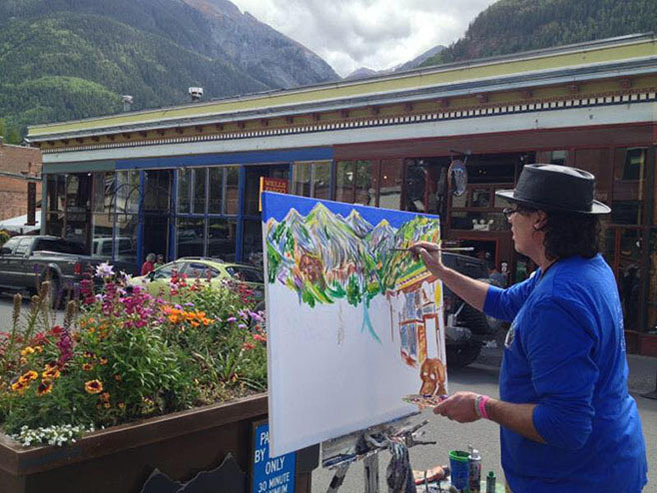 Campbell is often referred to as ‘the guy painting at Red Rocks’. He has completed more that two hundred performance paintings at the world famous venue. 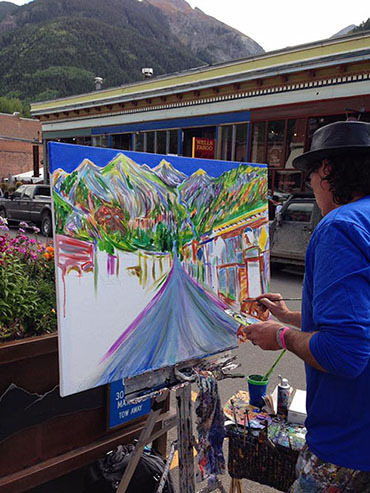 Only miles from his home, he admits, “the Amphitheater is my favorite outdoor studio, can you blame me?” During his long career, he has painted more than two thousand paintings at nearly a thousand musical events across the country. Campbell not only produces work but curates as well. He curated the Denny Dent: Two Fisted Art Attack and Convergence: Painting with Music exhibitions in 2010 at the Arvada Center for the Arts and Humanities.